I have spent a bunch of hours of my free time adding to free pascal compiler a brand-new target: the Nintendo Wii. The compiler works and spits out .dol executables; the RTL, is an adaption from the NDS one, but works too. Yesterday I have committed the libogc to the fpc SVN repository and some examples that show how things work. This week-end I'll post on the fpc wiki some more infos to show how to build all stuff. 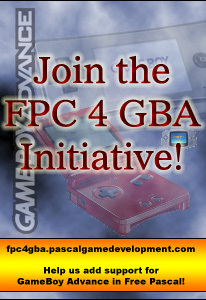 ...and, of course, fpc4nds/fpc4gba has been released too. Now it is compatible wit devkitARM r32 and libnds 1.4.8, so please update your dkA packages. What's new? Among other things, many compiler bugfixes, Delphi 2006 like for..in support, support for sealed and abstract class modifiers. Oh! And a brend-new libndsfpc chm reference file too! So, after a few months I'm coming back here. I was busy with my new job and I had some hard times too, but things are going better now. Let see, there are some good and bad news to show. First of all, maybe you have noticed that there is a new devkitPro and libnds version, so I'm spending my vacations to update fpc4nds and libndsfpc. There are a lot of changes to do and something does not work yet as expected. On the other hand, some old bugs have been fixed. I'm working now on a mechanism that should allow accessing files in the pascal way (assign, reset, rewrite, read, write, close, ...). In the next release it will be an audio library too, maxmod, that is a way better than older libs that where shipped in the past with libnds. About the book: because some heavy changes in the library interface, I need to rewrite some parts here and there, but my main problem is the lack of time because my new job, so don't expect anything soon.